DK Publishing and the Smithsonian Institution worked together to create a fascinating book for kids (and adults) who are fascinated by the world around them. The Elements: A Visual Encyclopedia of the Periodic Table makes what could be a dull subject very shiny indeed. Sure, you have your basic periodic table for quick reference. But every element gets its spotlight, with truly interesting facts and many intriguing photos. Take iridium. It’s a shiny black metal that’s 22 times as dense as water. That’s heavy. You can find it in meteorites, compasses, the Chandra X-ray Observatory, and Badlands National Park in South Dakota. Elements are discussed within their related groups. The Boron class includes Gallium, which melts at just 84.2° F—which means it will melt if you hold it in your hand. You’ll find it in thermometers, Blu-ray lasers, LEDs, and solar panels on NASA’s Mars rovers. The Elements is a great book to browse. You’ll learn which element makes super glue so sticky, which element has more than nine million compounds (and a pure form that makes our most precious jewelry), and which rare element is used to make everything from catalytic converters to surgical instruments to commemorative coins. 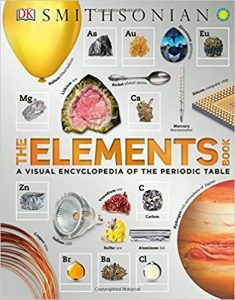 If you enjoy learning about The Elements, you may also find DK Publishing/the Smithsonian’s other books amazing reads, too.